Credit creation is one of the fundamental banking practices that allows economies to grow. Banks and other financial institutions do this by offering loans and accepting credit applications. 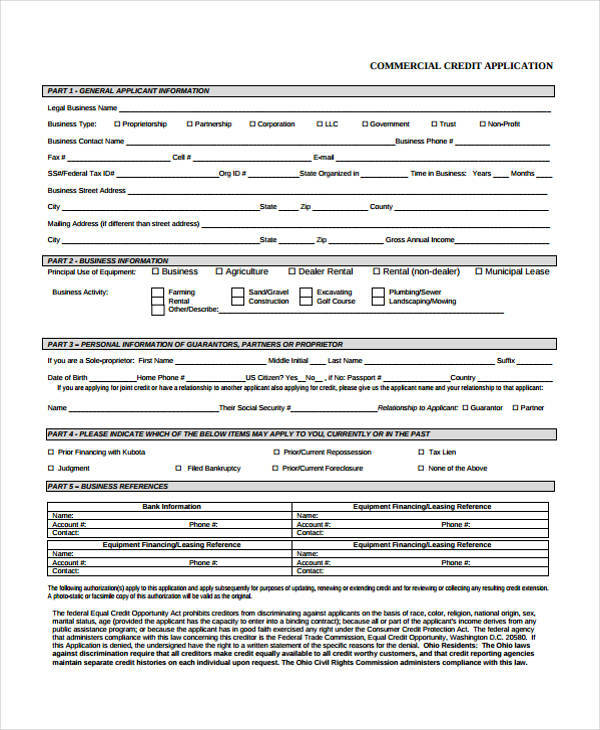 Subsequently, financial institutions need to create credit application forms that potential clients need to fill out prior to doing business with them. 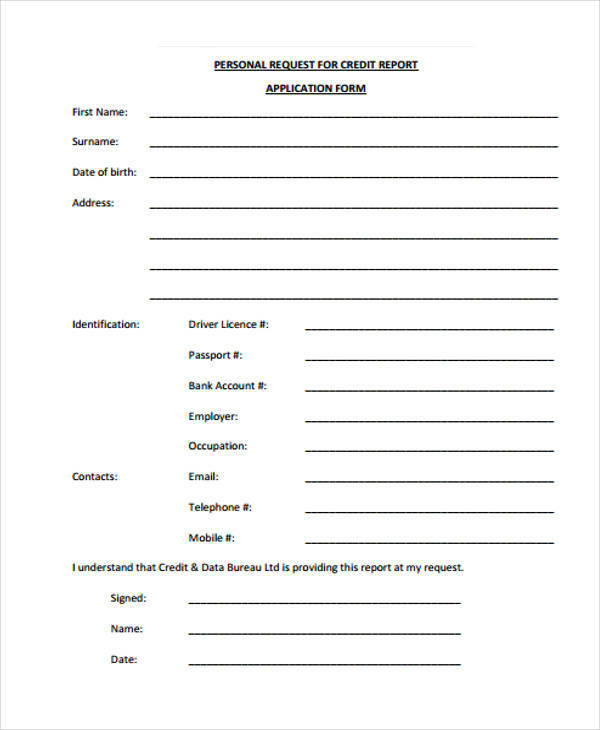 Just like how a job application form works, a credit application form serves as a summary of an individual’s personal information that a bank needs. Usually, banks need information related to one’s financial records, addresses, income, and present occupation. These are used to gauge a person’s capacity to pay them back. 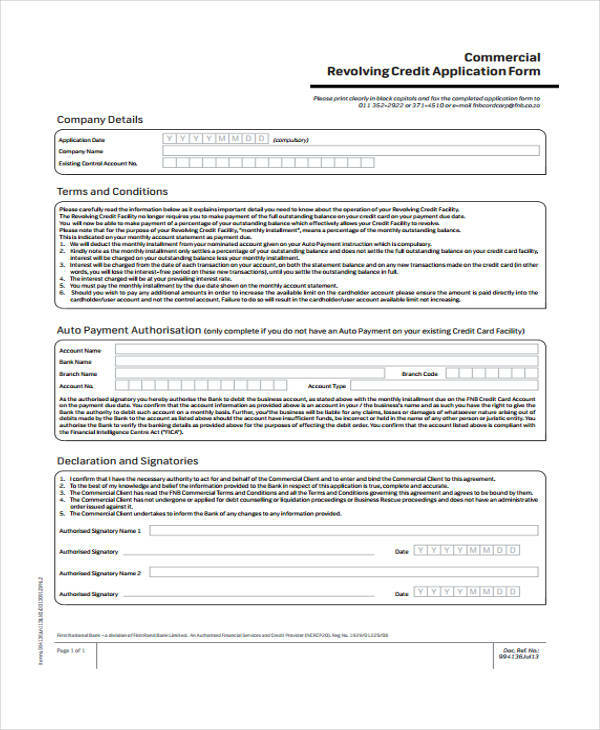 A credit application form is a data sheet required by banks before approving loan requests and credit card applications. 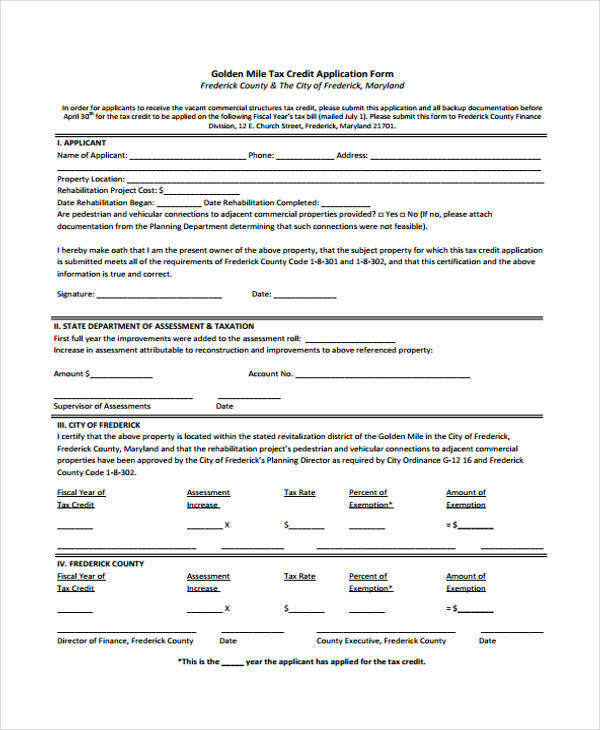 This form will state the bank’s policies for granting credits and the customer’s responsibilities for paying back the loaned amount. 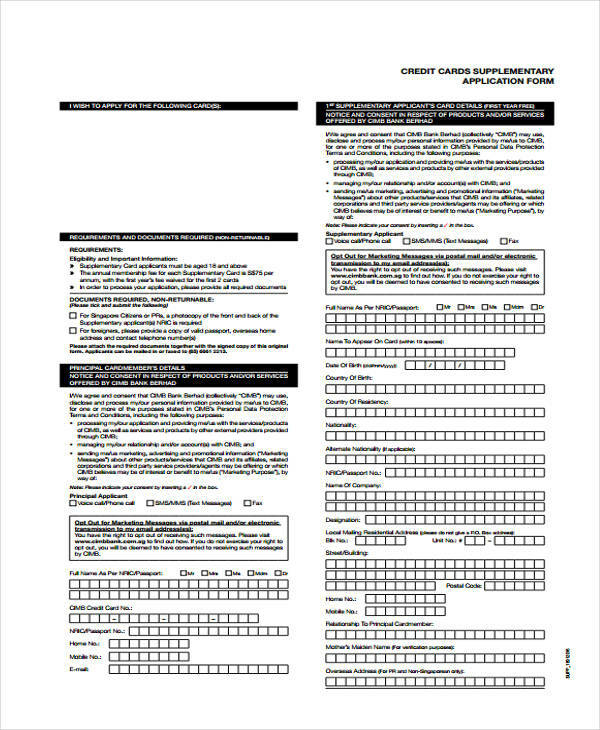 Signing this form means that you agree to the conditions set by the bank. As mentioned earlier,banks may also require individual credit checks to accompany each application. 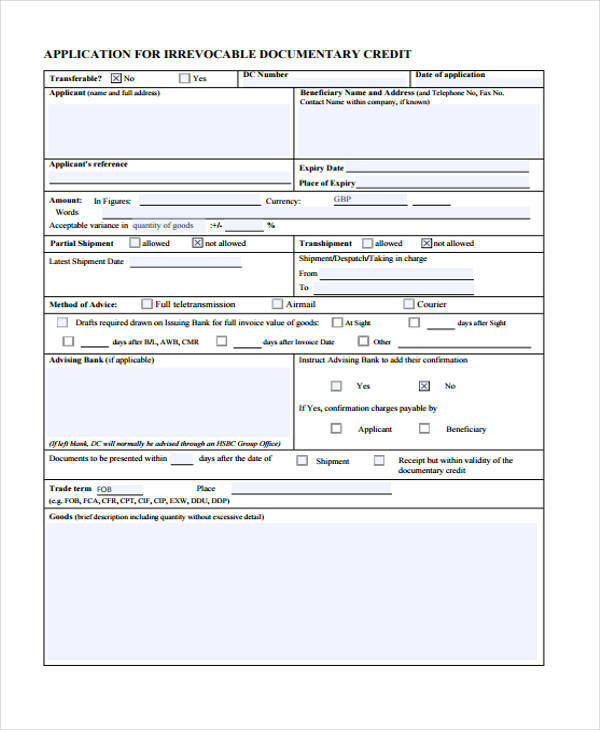 To familiarize yourself with these kinds of forms, you may scroll through the different sample credit application forms on this list. 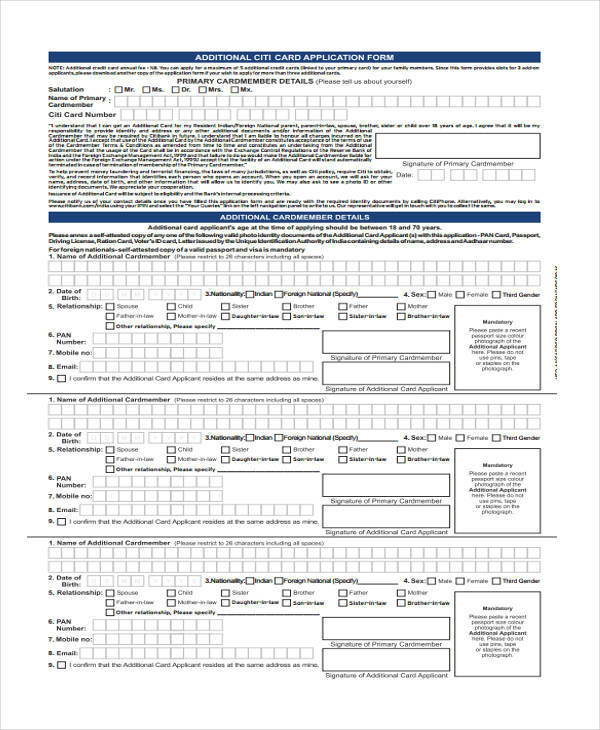 They are actual forms used by legitimate financial institutions in the country. 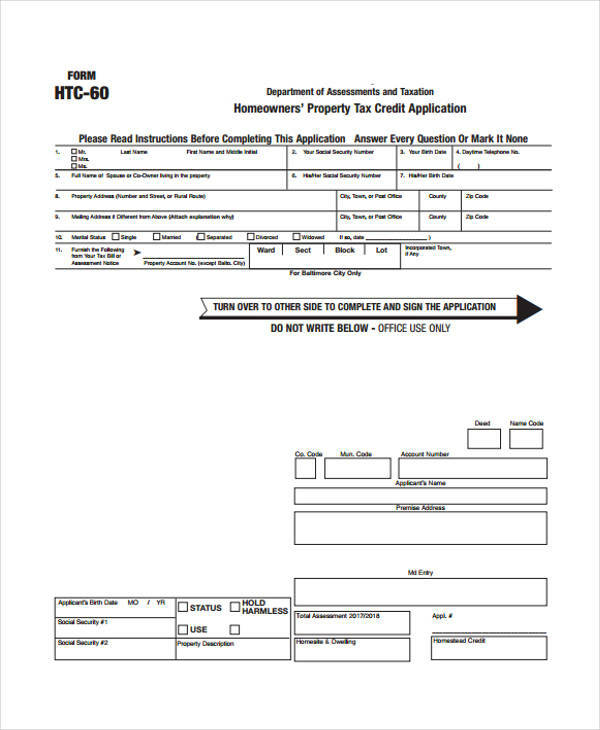 What is Included in Credit Application Forms? 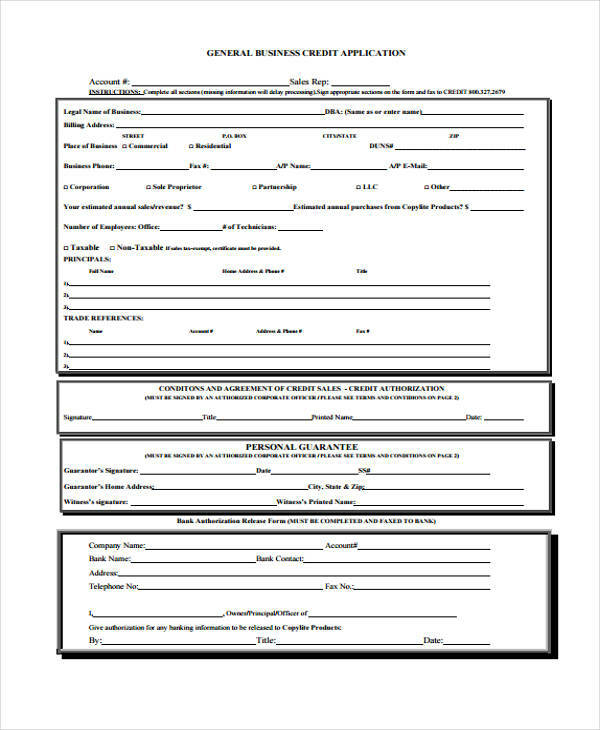 This is not an exhaustive list nor are all items required for each credit application form. 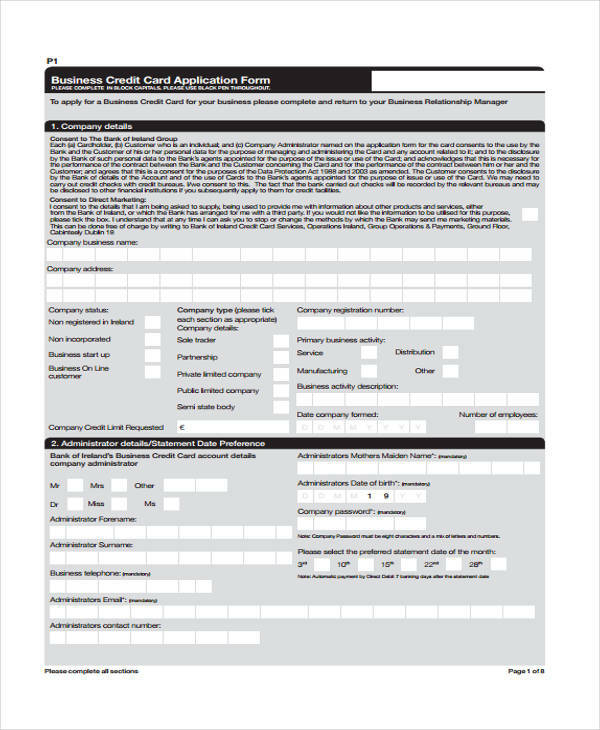 Also note that firms may have a different set of requirements for their business credit application forms. First, determine the specific purpose of the form that you are creating. 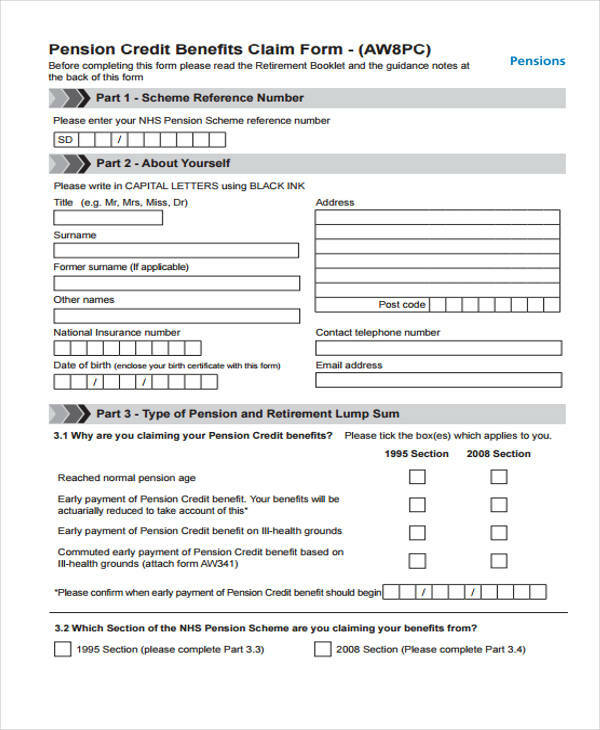 Is it an application form for credit cards, pension credits, or tax credits? 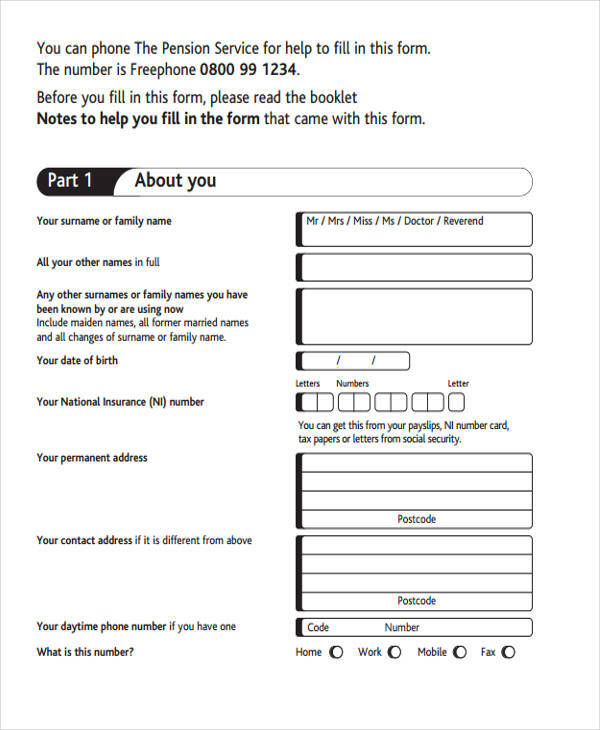 Second, ask for determine the necessary information needed for the type of form you are creating. You may obtain this information from your company’s accounting team. Once you have gathered all these information, begin by designing the form in a spreadsheet or whatever program you have available. Depending on your level of expertise and company’s policy, this task may be delegated to a design team or outsourced. 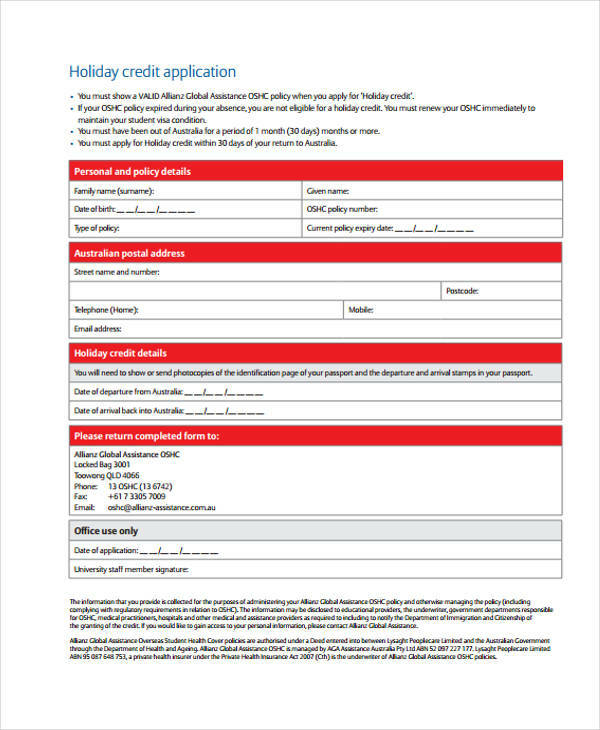 If you are designing the credit application form yourself, make sure each required information is present visibly on the page. 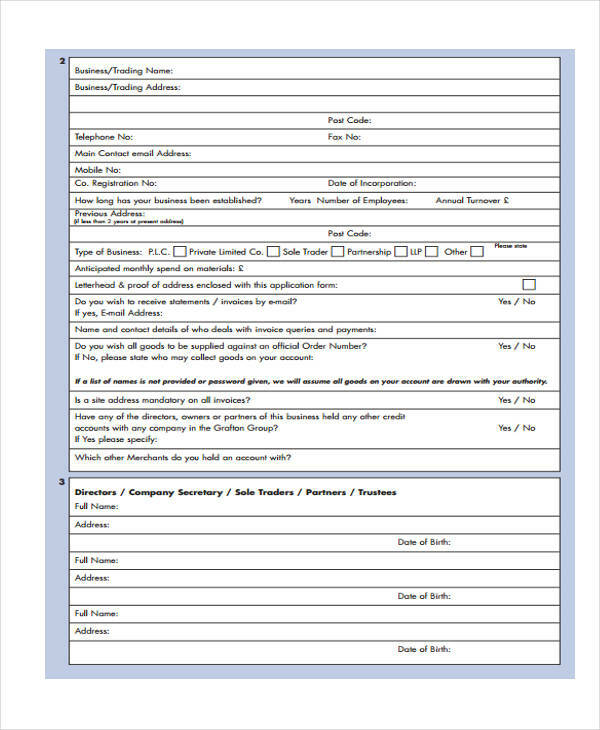 Allow ample space for customers to fill out their answers on the data sheet. 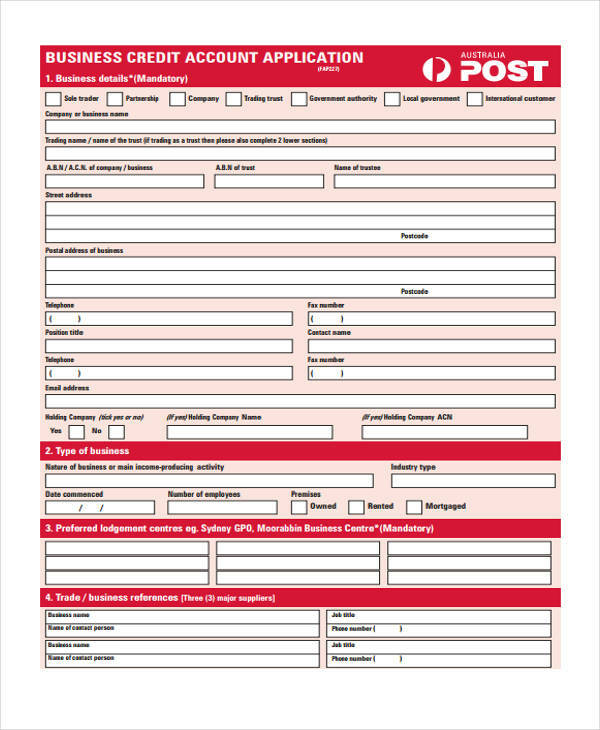 Also make sure to include concise instructions on how to fill out the form. 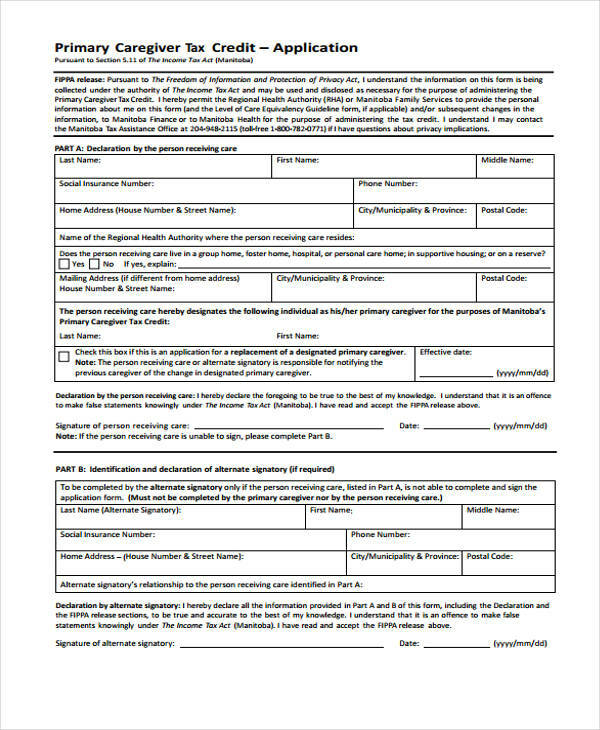 You should also consider whether to include a portion on the form where form evaluators can sign upon receiving the application forms. 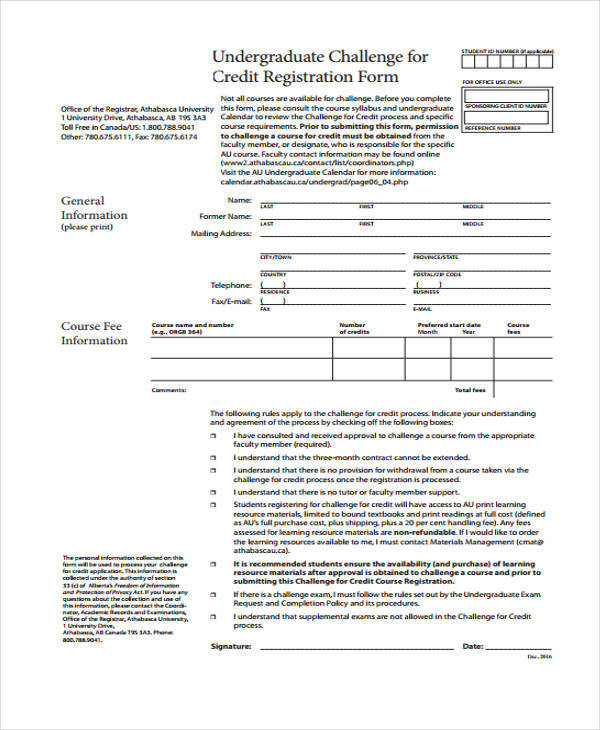 Include a portion on the form where clients can affix their signatures to confirm consent to credit checks. Once you have completed a draft, present this to your company’s management and legal team for evaluation and make necessary changes based on their feedback. 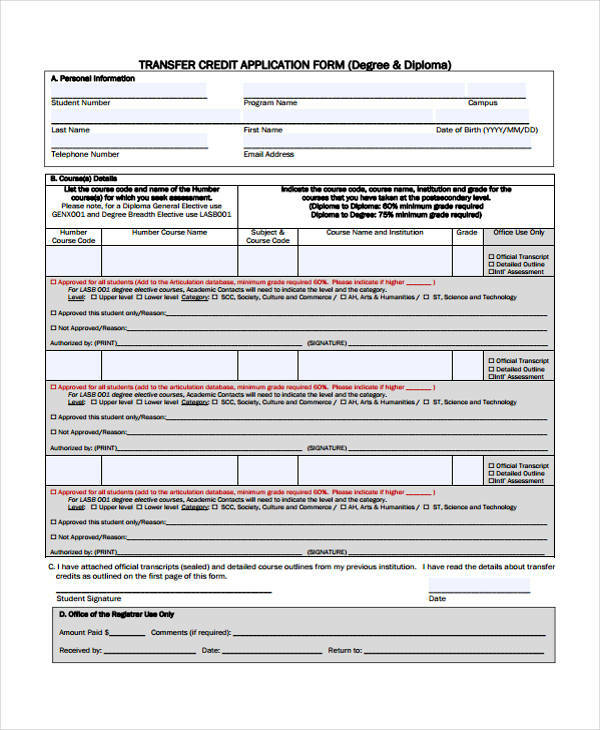 When the form is approved, you may begin distributing the forms to the company’s sales and customer-facing teams. Business establishments extend credit to customers when they allow credit card and cheque payments. In the same way, the government extend credit to its citizens when they allow tax and pension credits. 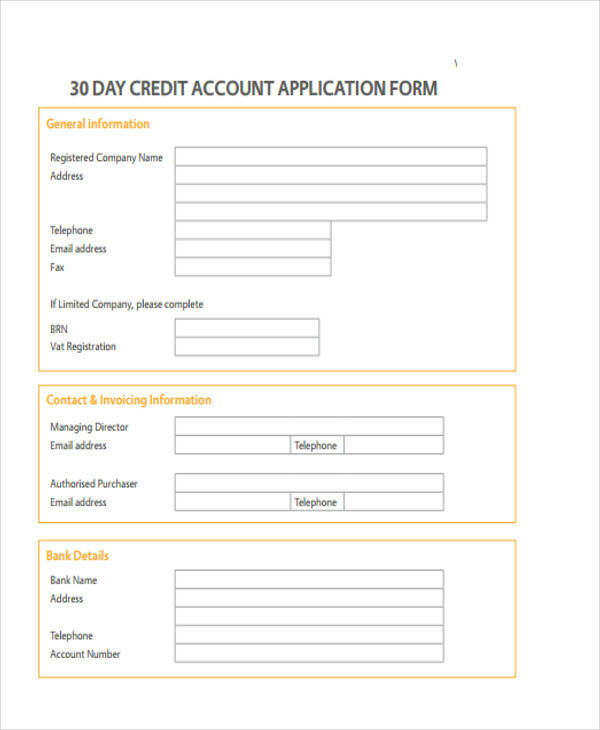 We have listed more than 20 credit application forms format in this article. 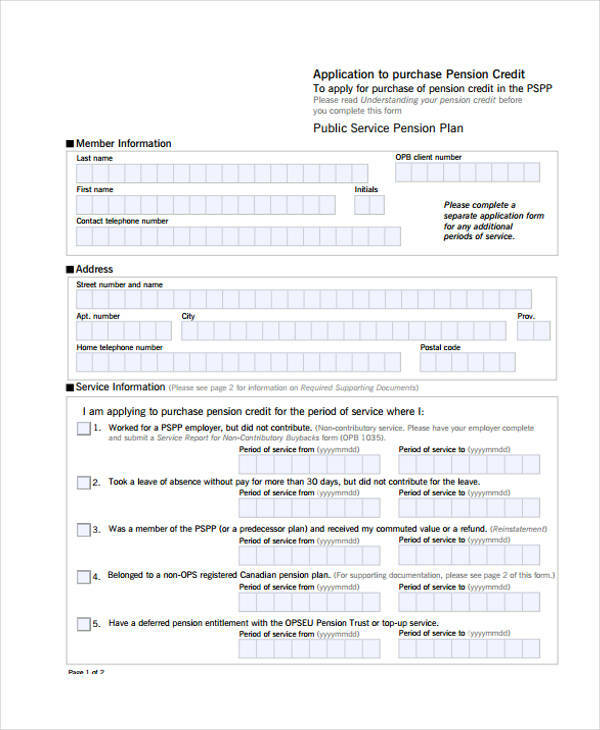 Different forms are used for pension credit applications, business credit applications, credit card applications, documentary credit applications, tax credit applications, trade credit applications, holiday credit applications, and commercial credit applications. 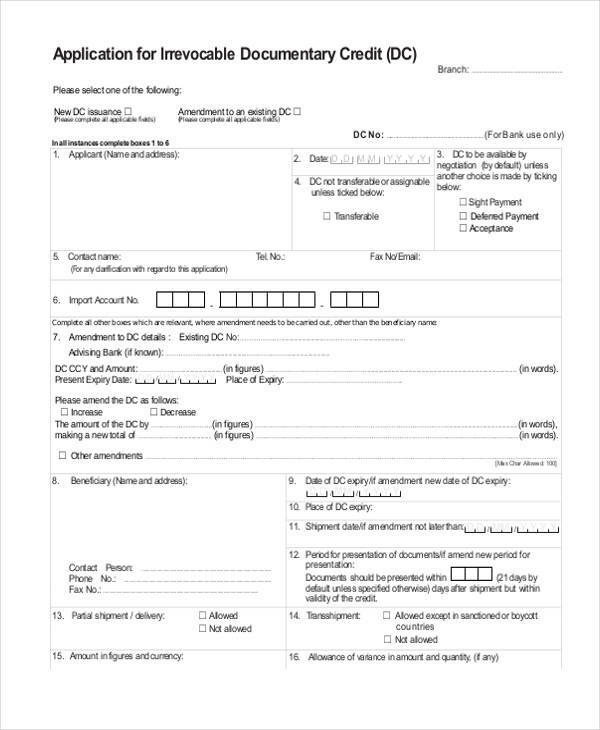 Even if the names differ, all these credit application forms provide clients a certain amount of money when the applications are approved by a bank or government institution. However, not all forms of credit, and their corresponding credit application forms, signify that exchange of money occurs. In academic institutions, credits are given for each subject that a student studies and transfer of these credits is allowed between colleges and universities. 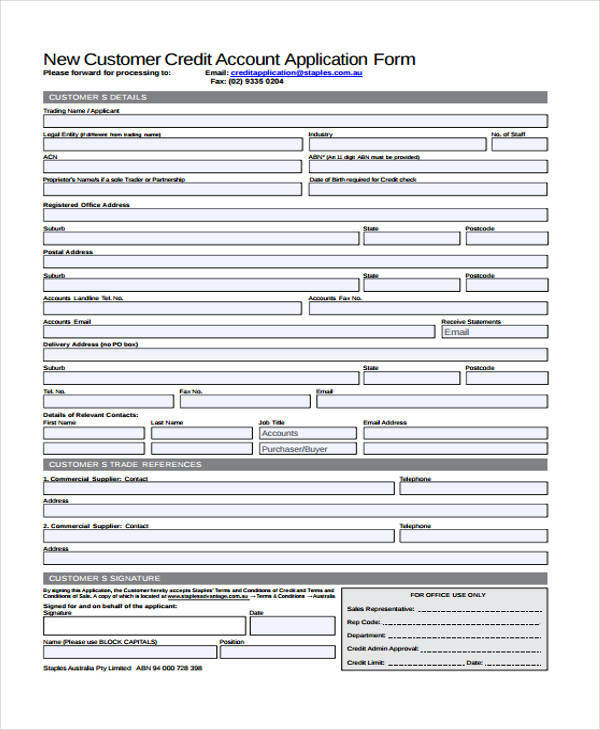 A student may file a Transfer Credit Application Form to their university registrar if they wish to transfer schools. 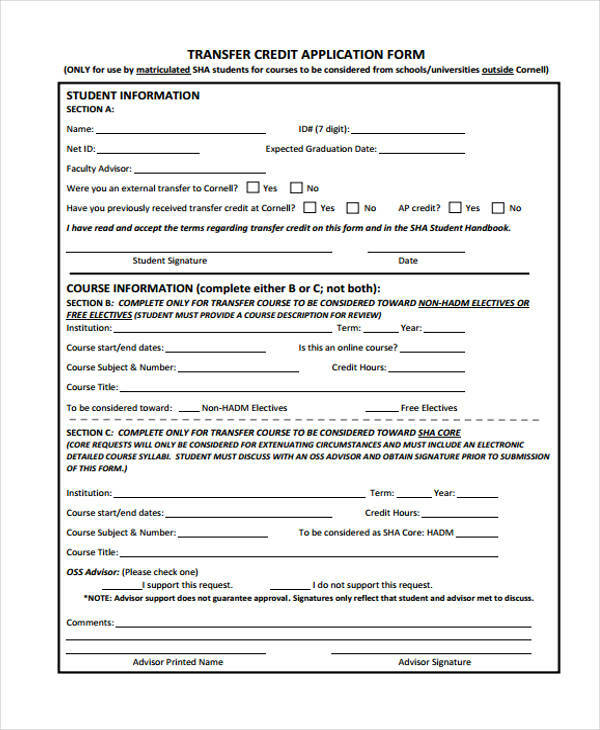 Students may also question the course credits reflected on their transcripts by submitting Challenge Credit Application Forms. 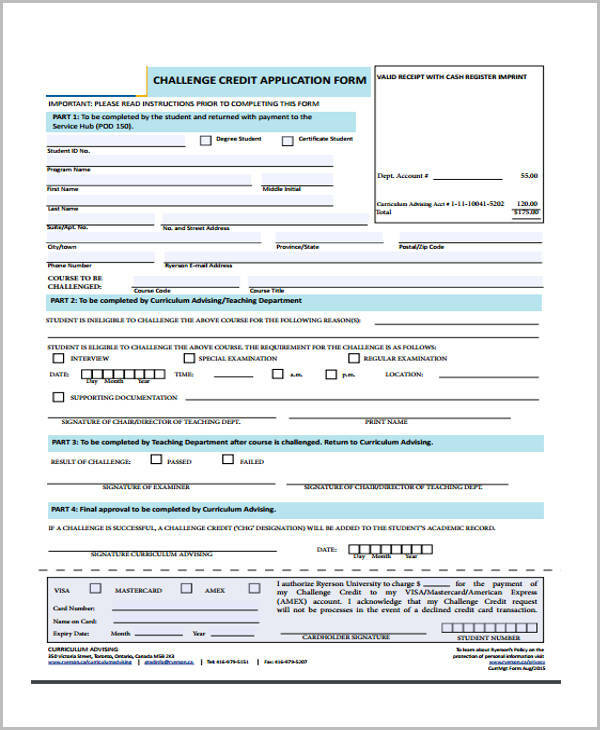 We have included Challenge and Transfer Credit Application Forms in PDF format on this list that you could customize if your school organization needs to create one. 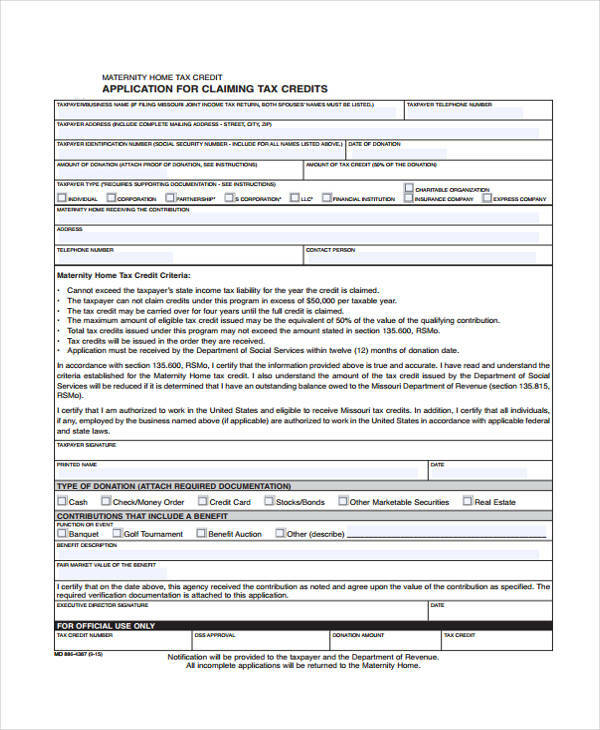 Filling out credit application forms can be daunting especially if you are applying for bank loans or credit cards. 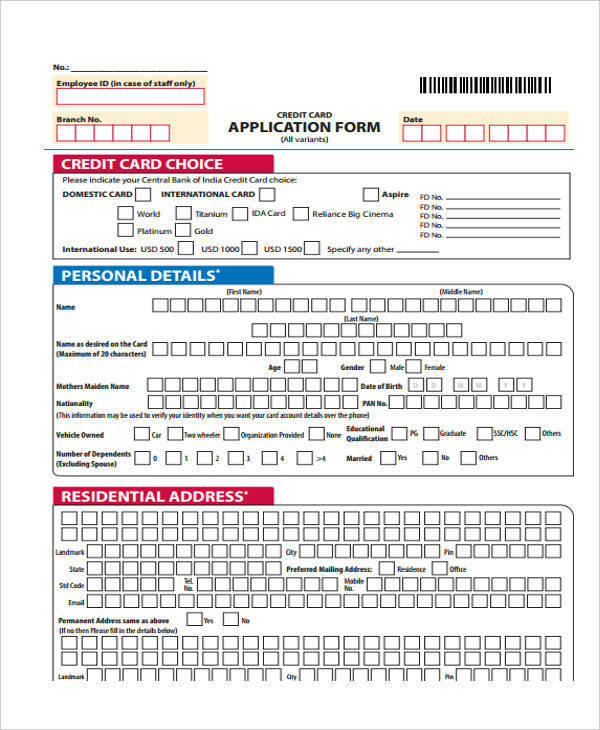 You may even practice filling out an printable application form first. To avoid rejection of your application/s, heed the following tips for a successful application process. Be consistent with the data you have provided. Financial institutions conduct thorough credit checks in order to help minimize the risk that they are taking when they extend credit to you. Mismatch in the data provided like different income sources may cause a red flag especially when filling out a business application form. Be truthful. 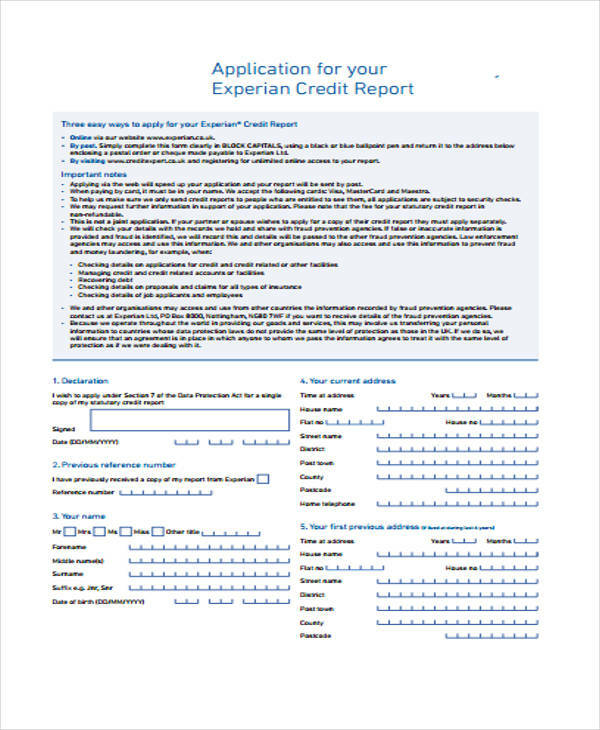 In connection with the previous tip, any financial information that you input in credit applications can be cross-referenced with credit and background checks. Be honest and your application will be approved. Take care of your credit history. Having a healthy credit history is achieved by regularly paying your mortgages and other bills on time. If you are thinking of applying for a credit card or loan and your credit history does not look good due to past late payment, you may try automating your payments for a couple of months before proceeding with the application. Leverage your income and current assets. Sometimes, banking institutions will extend credit to individuals who are regular employees of reputable companies. This is in the belief that these persons are well-compensated and will be able to pay back their loans.